Doing a Predicted Exercise – I am now getting predictions for an exercise – How do I train using the prediction? Once you do an exercise, AMP Your Workout “knows” a bit about you and can predict your next attempt. It learns more and more each attempt and guides you to better workouts to suit where you best perform. 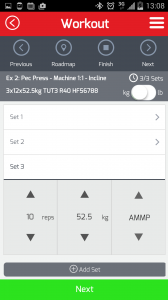 This guide will help you in doing predicted exercises using AMP Your Workout. After the first time you do an exercise you will get predicted targets for the exercise – to suit your abilities. 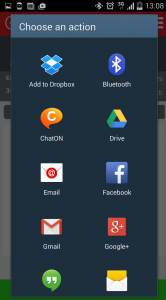 You also no longer have to Enter Data! Here in the image below, the first set has been started and completed. 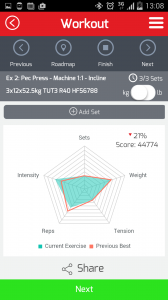 If you are using a smart watch the reps will have been counted as well as the timing (tempo) of the rep phases so Lift – iQ can determine the actual load on your muscle. With no smart watch – lift iQ defaults to the predicted reps. Weight and reps can be edited after the set. If you meet the target reps, no editing is required. Note: The count down timer (in the start bar and on the smart-watch) is the time to your next set. 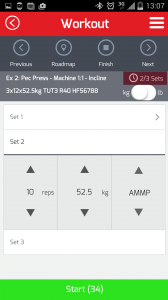 If you are using a smart-watch, once you have verified that the reps and weight are correct, you can press “NEXT” and it will show your rest count-down. Press “Start” when you are ready for your next set – you can go earlier than the indicated timer, and try to beat your prediction – or your can go later than indicated, but i this case (longer rests) your score will most likely not reach the target unless you are using more weight or greater TUT than set as your target to make up for the longer of the exercise (reduced work rate). Following image shows that you have completed second set, you can see the the counter “2/3 Sets” highlighted in the image below. Here the set 3 has been completed. The Smart watch recorded that you achieved 10 reps again (or if you do not have a watch, the reps carry forward from the last set – it assumes that you will get similar reps again). The “Next” button takes you to the next exercise. If you decide to add another set, you can select “Add Set”. Here in the above diagram you can see the LIFT Pentagon provides a summary of the exercise. The overall score is down 21% because the reps weren’t achieved during the exercise. This could have been a case that the reps were lower because the TUT was more than the target 3 secs – but we can see here that was not the case. Time Under Tension (TUT) was good. However the intensity was higher than the previous best (you started before the timer got to 0) – and this is probably what reduced your reps. AMP Your Workout will learn from this combination and provide a different guide next time to keep you in your ideal performance. If you had beaten your score with the shorter rests, AMP Your Workout would learn from that and factor it into your next prediction as a training mode where you perform well. Once you have finished an exercise and seen your score, you can post it via any social media channel. After finishing the last set of the exercise, the system will then move to the next exercise in the sequence. As per the last time it will upload the exercise and then check your history and trend analysis and provide you with predicted targets. When you get to the last exercise, the bottom bar will be “Finish” rather than “Next”. Note that if you are at the last exercise but don’t want to finish yet (you might have jumped to the end using the “Roadmap” screen, or pressing next/next/next) you can use the Roadmap to go back to any exercise in the workout. When you “Finish” the workout it will then show you the summary screen. When you review your summary press “Done”, system will then go back to Roadmap screen. If there is more one one split, it will automatically cycle to the next split in the sequence. 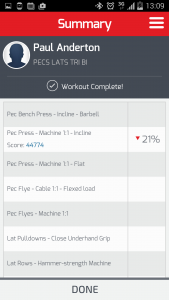 In the demo below, we have only completed one exercise – normally, all your exercises will be shown with a score of your performance compared to the target. Note that once you have finished, you will be back at the Roadmap screen. 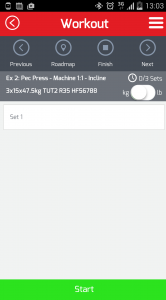 In the PT version, the PT will select “My Gym” from the menu and continue with the next client.